I'm going to round out HashtagOrangeWeek with a pizza, because it's Friday and I frequently share pizza posts on Fridays [and nearly always fix pizza for my family on Fridays, even if I've just arrived home like today]. You may think that oranges on a pizza could only be on a dessert pizza. You'd be at the wrong blog, my friend. I'm not saying that I'll never do a dessert pizza, but I have not yet done one and have no plans to do so at this time. Besides, I just shared a cookie recipe using oranges, Orange Oatmeal Chocolate Chip Secret Ingredient Cookies, and a sweet muffin recipe using oranges, Orange Olive Oil Date Muffins. Why am I sharing a week's worth of recipes featuring oranges from Florida? I spent this week in Florida watching my son's high school marching band parade at Disney while soaking up sun and warmth. Since the trip was financed, in part, by selling Florida citrus in the Band Fruit Fundraiser (link to my recipe round up featuring 156 Recipes Using Fruit, from 66 bloggers) I decided to take this week to share recipes I've been making using the fruit we bought in the sale. The BLUF of this recipe is that it's good to have a broiler. This pizza benefits from being hit from above with a direct heat source to finish it. The cheese browns and the oranges caramelize, just a bit, and that is a nice touch. The other weekend we were at a sled hockey tournament in Ft Wayne, Indiana and the TV didn't get any Olympic coverage. Boo. However they did have Food Network (I don't at home), where I saw a gal in Minnesota make a kimchi pizza in an amazing copper oven. She'd lift up the pizza--with a super-long pizza peel--to the top of the oven to hit it with a final blast of heat. Wish I had that set up. In a second kitchen as there's no room in mine. It is tricky, timing the amount of 'broilerage' required for the oranges without overdoing the crust and cheese. If I had a creme brûlée [hey the spell checker automatically put all those hoodads on the letters. Wicked cool] torch I'd hit the oranges individually with that instead. For more recipes using oranges, please see my Orange Recipes Collection. It's part of the Visual Recipe Index by Ingredient, a resource for folks like me overwhelmed with Band Fruit Fundraiser citrus or who just like to stock up when it's on sale at the store or who live next to a citrus farm. You pick. 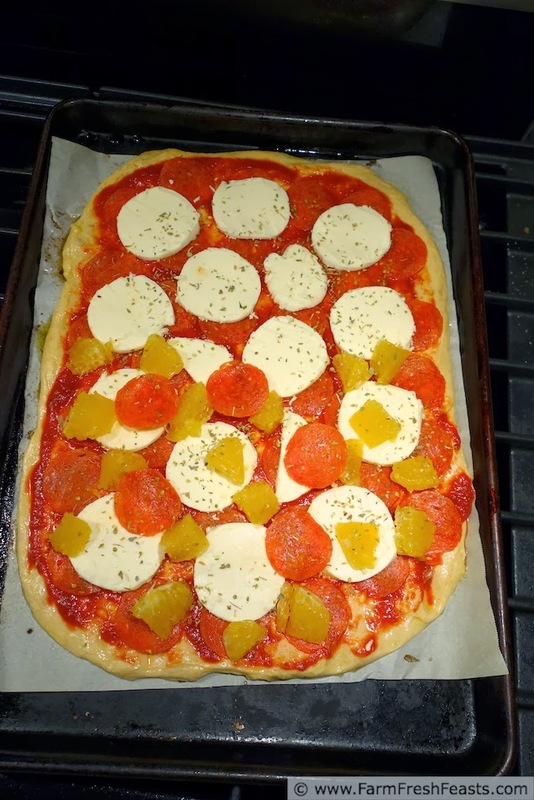 For more pizza recipes, including an entire category of Savory Pizzas With Fruit, please see my Visual Pizza Recipe Index. 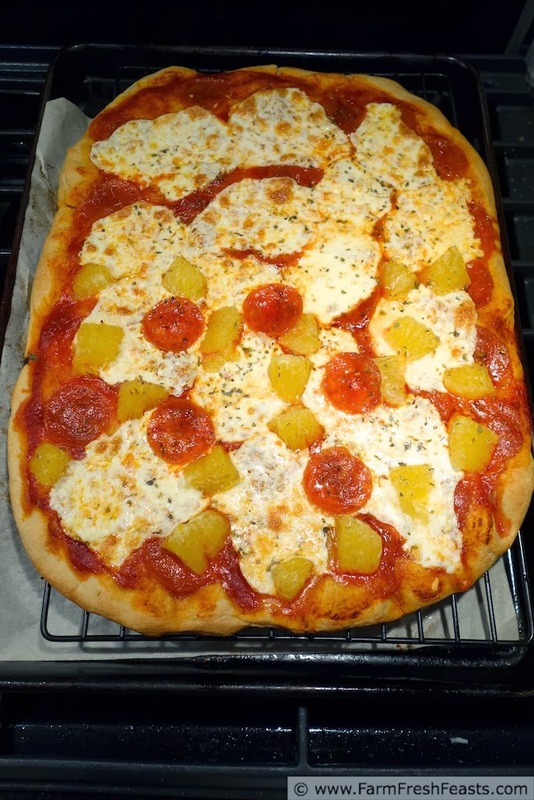 I'm also pinning interesting pizza recipes I find to my Pinterest boards, follow me there. I'm sharing my latest pizzas in rough form on my Instagram feed, follow me there. I'll share articles that catch my eye on my Facebook page, follow me there. Want to know How to Use This Blog? Preheat the oven to 450 degrees Fahrenheit for a good half hour, up to 1 ½ hours if your spouse is delayed home due to snow. If you've got a pizza stone, let it live in your oven and preheat as well. If not, use a cookie sheet. On an oiled piece of parchment paper, stretch out dough to the shape that appeals to you. 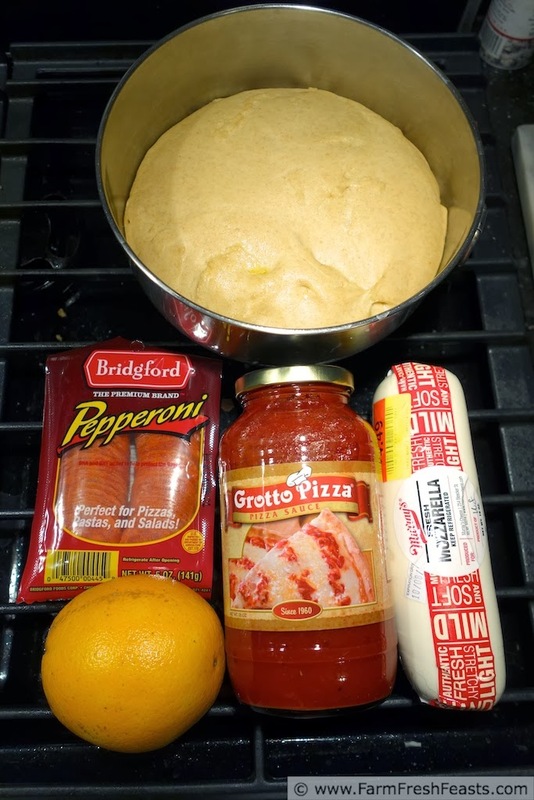 I was trying to please everyone, so I made a rectangular pizza and did halfsies with the oranges--though I've written this recipe for a full pizza. Spread the pizza sauce on top of the dough. Top with mozzarella slices--warning, they do like to spread--and pepperoni and orange chunks. Scatter seasonings across top of cheese. Bake on the parchment for 5 minutes, then shimmy the parchment out from under the crust and bake directly on the stone for another 3 minutes. Turn on the broiler and move the pizza up to an upper rack so it is 3-4 inches from the broiler. 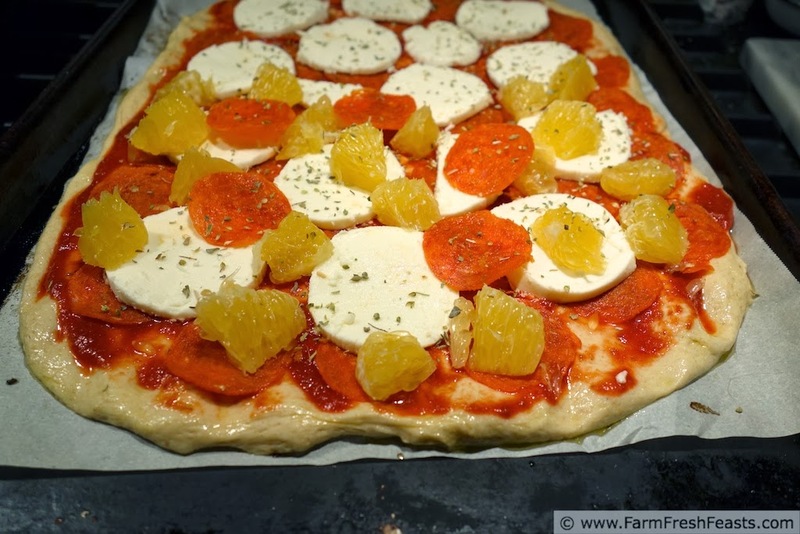 Watch carefully and remove when the cheese is browned and bubbly, crossing your fingers that the crust is not over browned and oranges have been adequately caramelized. For me that was about 2 minutes. Slice (Amazon affiliate link to my favorite pizza slicer) and serve. You only pepperonied and organe sliced half? I take it the kids weren't willing to give it a go. Their loss, I'm sure. 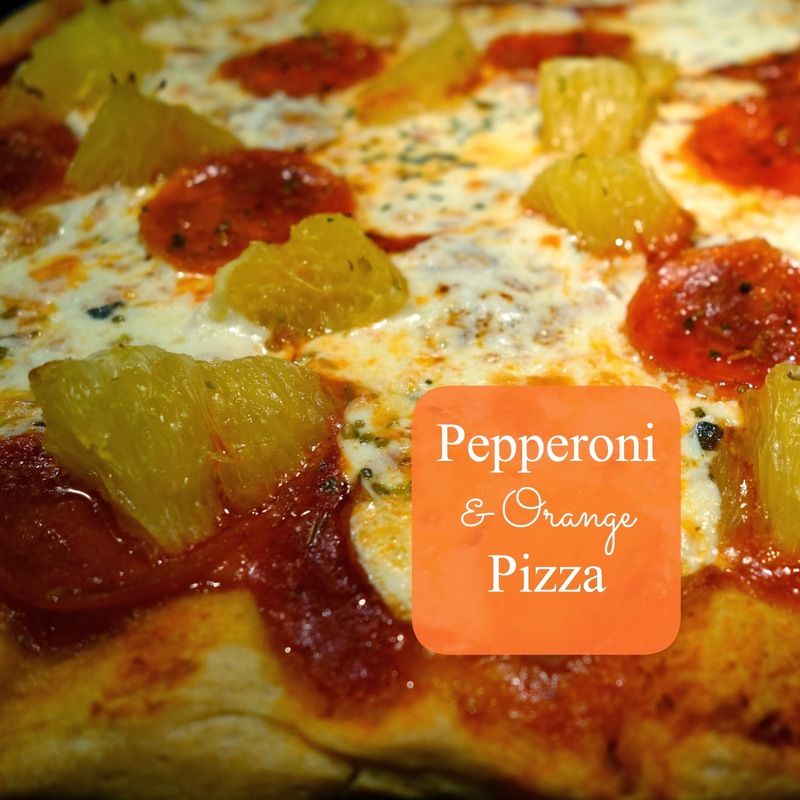 I love the idea of caramelized oranges along with the salty pepperoni. If I were to go back to meat, pepperoni, along with bacon, would be things that bring me back. This sounds awesome. Yes, only half. Trying to please all of the people all of the time. I think bacon is the gateway from vegetarianism. Now I'm craving pepperoni. And it's only Thursday. What to do, what to do . . . This combination was really good, but I never would have thought of it myself! I'm glad you liked it! Thanks for stopping by! This sounds so unique! I've never thought of putting orange on a pizza....interesting!